Q: Arguably the most difficult thing converts face is telling their families about their conversion. It is a source of great anxiety for many, but your story has a happy outcome alhamdulillah. Janis, please tell us about how this chain of events began. When did you decide to convert? Janis: Well, ever since I was little, I was conscious of God and very much in love with Him. I was raised Catholic and went to a Catholic school in Costa Rica, so I always prayed to God, Jesus, and the Virgin Mary. Subhan’Allah, I used to pray to God to make me be like the Virgin Mary, and now I dress like her! In 2011, I went to Costa Rica with my dad and my son who was four years old at the time. I decided to take a book to read as I always do when I travel. Something drew me to take the translation of the Holy Qur’an that had been sitting on my bookshelf for five years. I had read some parts of it here and there, but never cover to cover. I began to read it on the plane, and continued with it after we landed. My son and I would read it at night wherever we were sleeping during our trip. We called it the “God book.” The interesting thing is that during the day I would have questions or even doubts, but when I read at night my questions would be answered. After I returned home, I met two hijabi girls in my genetics class and we quickly became good friends. They invited me to their mosque where lectures took place weekly. When my mom found out that I was attending these lectures, she began to change her behavior toward me. I said, “No I believe he was a very special creation of God.” I think that was sort of the validation she needed to continue her path on Islam. When the changes started happening (she began to wear long blouses over jeans and a scarf around her neck), I panicked! I couldn’t understand what was changing in her and why. Then she started to wear hijab and eat only halal food. My reaction was to throw at her all the convincing arguments I could think of. I would say things like “only turtles cover their heads” and “God created us like flowers so that our beauty could be seen” and “since when is it our responsibility to cover ourselves? Isn’t it the man’s sin if he has lustful thoughts?” Janis is my only daughter and although she and I have always been modest in dressing, I still considered this new behavior to be something that didn’t belong in our culture. Little by little I tolerated the changes in her but I never made an effort to understand Islam. What was so hypocritical of me is that I worked with two Muslim women for many years and I respected them and their religion. I knew about Mecca and the five pillars, but only attributed Islam to them because they were from Afghanistan. When my own daughter converted I didn’t try as hard as I should have had. Although looking back, and knowing that God is indeed the perfect planner, I know that things happened only when it was the right time. In His wisdom, God knew that even if I had tried, the veil between me and my faithwould not have lifted then. Janis: I’m so thankful for everything that led up to this. At first, my mom didn’t like me going to the mosque, so when I decided to take my shahada I didn’t tell her or anyone in my family. Pretty soon, however, my parents started to notice the difference in the way I dressed. They figured it out before I even told them. 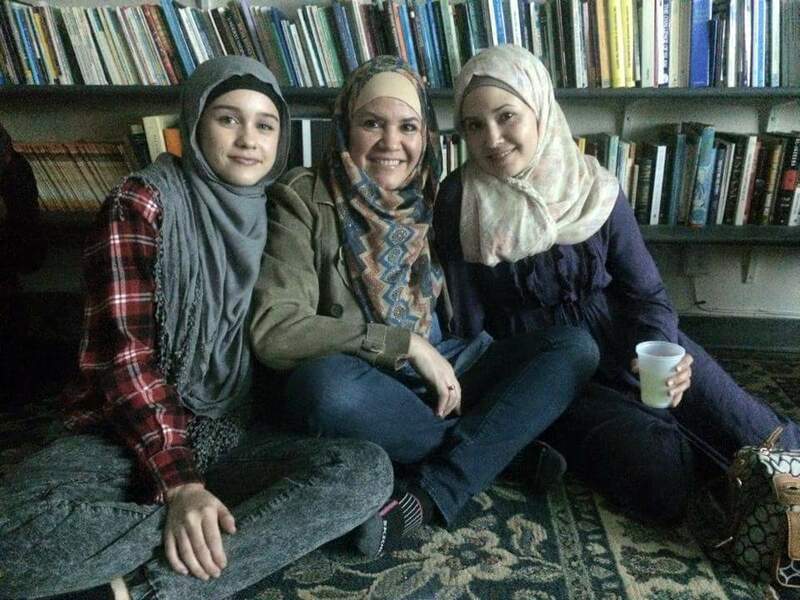 I remember my mom saying once, “I’m fine with you going to the mosque and I’m fine with you learning about Islam, but the day you cover your head is the day I stop talking to you.” And so it sort of happened that way. In June 2012 I made the choice to wear hijab and every time I came through the door my mom would not kiss me or hug me until I took it off. For almost a year she wouldn’t even go out in public with me. I had learned that we had to be respectful to our parents no matter what, so I tried my hardest to be kind to them despite their insults. Since the night I took my shahada, I asked Allah to please bring my mother and at least some of my brothers to Islam because I wanted them to feel the happiness and fulfilment I felt. I made sure it wasn’t with the intention that things would be easier for me, because what is life without tests? Q: Two years later, Giselle, you received another shock – your son converted to Islam too. What was your reaction like? Giselle: I had no clue Joel was studying Islam. Maybe he mentioned it and my brain chose to ignore it. I remember clearly the day he came home with Janis and he proudly told me he had made his shahada. He was positively glowing and I just pushed him away! I feel embarrassed and ashamed to have behaved this way, but as I look back I think it was more fear than anything. Fear that maybe I would lose him to a religion I knew nothing about. As the days went by, I didn’t see any outward change like I had seen with Janis (hijab, clothing, etc). Now I had two children, whom I loved dearly and had a very close relationship with, convert to Islam. As ignorant as I was I knew I could not continue my behavior because I knew I would truly lose them, so I slowly began accepting the fact they were now Muslim. Dr Cornel West can we just say Occupation? Why Do We Love Muhammad Ali? "Nouman, What Type of Muslim Are You?" Does Religious Freedom Still Exist for Muslims?